Natasha Boelstler, a junior majoring in neuroscience and minoring in German, has always been an explorer by nature. This wanderlust led her to apply out of state for college, and in 2016 she left her hometown of Detroit to settle in at UK. As a Chellgren Fellow, Boelstler developed her interest in research and learned skills such as how to apply for prestigious scholarly awards, interviewing, resume building, and even dinner etiquette. In fact, Boelstler was afforded one of her most memorable academic experiences through the program. 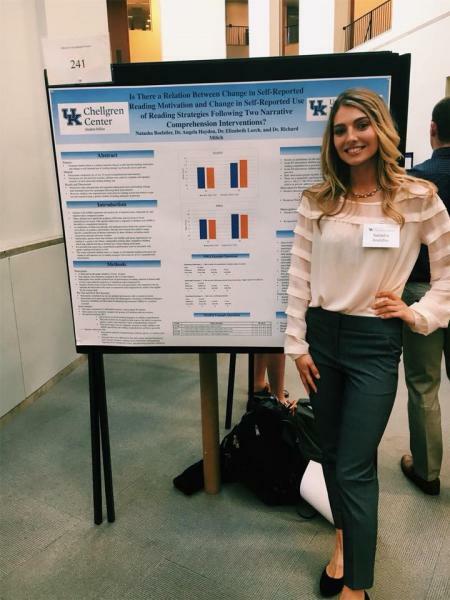 After working with Elizabeth Lorch and Richard Milich in the Department of Psychology, she presented her research at the Undergraduate Showcase for Scholars. While her two fields of study may seem very different, they relate to each other in unexpected ways. Boelstler feels her German courses provide a nice contrast to the scientific rigors of her biology and chemistry courses, challenging her to think differently. “A lot of influential scientists were German. I think my studies will definitely come full circle at some point. The reason why I decided to pick the two is that one day I want to move to Germany and practice medicine while doing research there,” she said. Boelstler spent the entire summer before her freshman year of college traveling throughout Germany, visiting Berlin, Dresden, and Munich. She can’t wait to go back, and plans on studying abroad in Germany. As a junior, Boelstler has a lot of experience to share with those considering a neuroscience major or pre-med track. Outside of academics, Boelstler enjoys service and is the philanthropy assistant for her sorority, Pi Beta Phi. In addition to philanthropy, there are many aspects of her experience that lead Boelster to call UK home.